In addition to keeping our customers safe, our top priority at FrontPoint is to provide exceptional customer service. 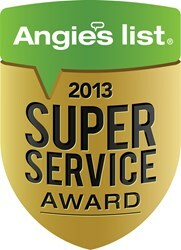 FrontPoint Security, the nationwide leader in wireless home security, has earned the service industry’s coveted Angie’s List Super Service Award, reflecting an exemplary year of service provided to members of the consumer review service in 2013. FrontPoint Security is the leading nationwide provider of interactive wireless home security systems and the only security company protecting every customer with 100% wireless and 100% cellular technology. FrontPoint combines next generation technology with remarkable simplicity and commitment to service, resulting in a safer and unique customer experience. With customers in all 50 states and Canada, FrontPoint Security is one of the fastest growing alarm companies in North America. FrontPoint is a GE Security Authorized Dealer and Alarm.com’s Preferred Dealer for no-hassle security solutions. For more information, please visit http://www.FrontPointSecurity.com or call 855.296.3945.